Unique ways to share random acts of kindness with U.S. Military Soldiers. Whether you know someone who's in the military and you want to send them a care package, or you're looking for a U.S. soldier to send a package to... start here! There are many educational benefits of joining the military. We’ll talk about 4 here: military scholarships for you, military scholarships for your family, learning important job skills while serving, and free tutoring services for you and your family. This time of year, we always send a care package or two to U.S. Troops overseas. If you want to send a holiday care package to the Troops, but don’t know where to send it, the following information should help. Here’s an amazing collection of tips — everything you need to know to send a care package to U.S. troops. FootyGI shows raw, rough, actual video footage recorded by U.S. men and women serving on the front line. It’s like YouTube for soldiers. These military gifts would probably be appreciated by the soldiers themselves, as well as military friends and family members. Anyone who supports the efforts of our servicemen and women will enjoy these novelties. Need some gift ideas for your military care package? Here’s what we sent the past few years. Each time, our care package received rave reviews from the soldiers. Here are some great links to others’ firsthand accounts of what the Boot Camp experience is like at Camp Pendleton. Flat Mommies and Flat Daddies are showing up everywhere! What are they? Life-size, 2-dimensional cardboard cutouts images of deployed service men and women. Military families are encouraged to get their free Flat Daddy or Flat Mommy today! Here’s a behind-the-scenes tour of the barracks, training grounds, Commissary, and all of the steps that a new recruit goes through the moment the bus drops them off in front of the Receiving Station at Parris Island. Here are a few interesting things I’ve learned from having a nephew in the Marines… some little-known facts about going through Marine Boot Camp at Parris Island, SC. Watch the movie September Tapes and try to determine if it’s ‘real’ or not. Regardless, it’s an interesting movie… a docu-drama on the search for Osama bin Laden. 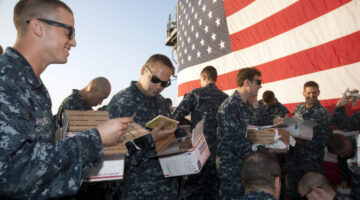 Everything you need to know about sending care packages to U.S. soldiers… from the best places to buy unique items that only a solider could love to ideas of things you can pick up yourself. Whatever you decide to stuff inside a care package, you can bet that a U.S. Soldier will love ya for it! A young U.S. Army soldier journals about her experiences in Iraq in her blog. I came across an interesting project called One Soldier’s Story. It’s an effort to collect first-person writings from current and former U.S. soldiers and present them in one collaborative hard-bound book.